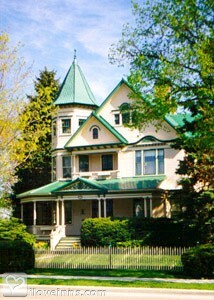 Whitewater bed and breakfast travel guide for romantic, historic and adventure b&b's. Browse through the iLoveInns.com database of Whitewater, Wisconsin bed and breakfasts and country inns to find detailed listings that include room rates, special deals and area activities. You can click on the 'check rates and availability' button to contact the innkeeper. Whitewater is centrally located to Madison, Milwaukee and Chicago. Guests to the Whitewater area enjoy the peace and tranquility of hiking and biking in the Southern Unit of the Kettle Moraine State Park. Bring a picnic and enjoy a beach site at the Whitewater Lake Recreational Area. The City of Whitewater offers professional entertainment at the Irving Young Auditorium, and arts at our area galleries. Winter guests to Whitewater, Wisconsin will enjoy snow shoeing as well as cross country skiing. Whitewater's downtown area hosts several festivals throughout the year including 4th of July festivities with parade, fireworks, food and rides. The lighted Christmas Parade comes right down main street Whitewater followed by hot chocolate in the park. Whitewater is a short trip to a well rounded escape any time of the year. Just ask one of Whitewater's innkeepers for more details. By Hamilton House Bed & Breakfast.